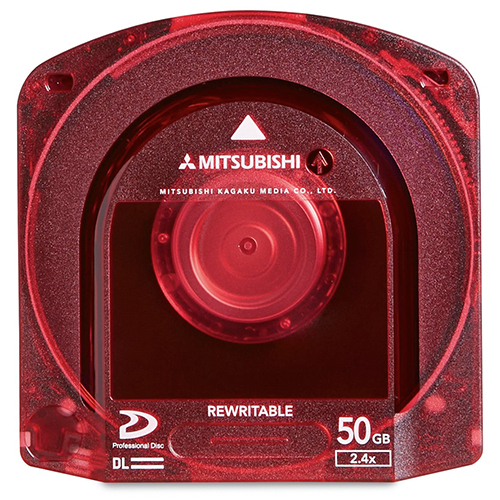 Verified by Sony to ensure performance and compatibility with XDCAM equipment, Mitsubishi Re-Writable Professional Discs the 50GB capacity provides up to 122 minutes of HD recording time on a single disc. Professional Discs utilize blue-violet laser technology for extremely high-density recording, and allow for instant random access to previously recorded materials. A rugged protective cartridge makes these discs extremely durable, resistant to dirt, dust, fingerprints as well as vibration and shock. The discs are packed in a semi-transparent case and include a paper insert to aid in the organization of recorded materials. Mitsubishi Professional Discs allow for up to 1,000 recording cylces and 1,000,000 read cycles without signal degradation. Combined with a 50-year archival and shelf life, these discs are a perfect archival solution for HD video or other important data. All Mitsubishi Professional Disc products are backed by Verbatim's Limitied Lifetime Warranty.